The Bureau of Labor Statistics (BLS) reported that payroll employment expanded by 252 thousand in December and the unemployment rate declined to 5.6 percent from 5.8 percent in November. Job gains in October and November were revised upward by a total of 50 thousand. The employment gains in December brought the average monthly gain for 2014 to 246 thousand, up from 194 thousand in 2013. At 5.6 percent the unemployment rate is 1.1 percentage points below its December 2013 level and only slightly above what Federal Reserve policymakers consider normal (5.2 percent – 5.5 percent). One caveat is that the decline in the unemployment rate was dominated by labor force defections rather than job gains. Other labor market measures were mixed for the month but better for the year. The labor force participation rate ticked down to 62.7 percent in December but has hovered between 62.7 percent and 62.9 percent since April. Average hourly earnings were down 5 cents for the month but up 1.7% for the year. The number of long term unemployed and part time workers were flat in December but down over the year. 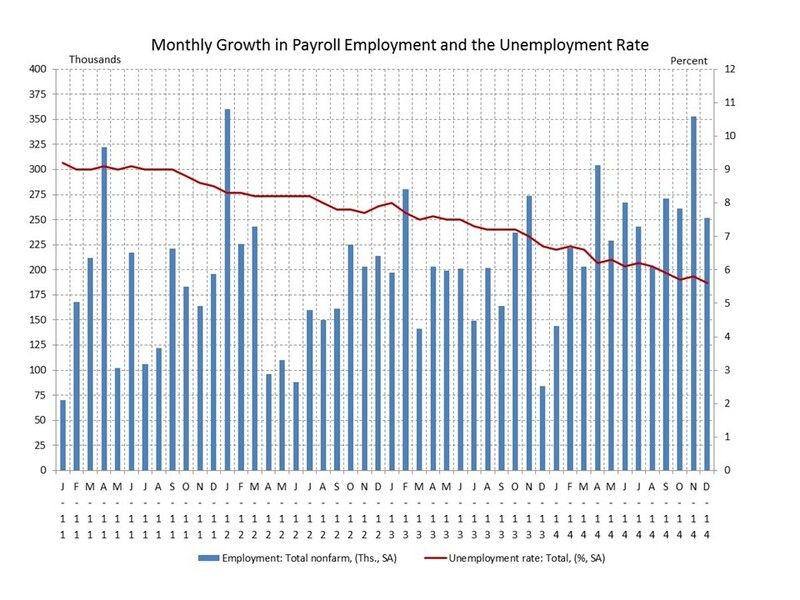 These numbers represent steady progress in the labor market for the year. This progress will shift the focus at the Federal Reserve from labor market improvement to below target inflation (FOMC). Another implication is whether further declines in the unemployment rate will put upward pressure on earnings and/or improve conditions for long term unemployed and part time workers. Higher earnings would be good for workers, good for economic growth and would put upward pressure on inflation. We’ll see what 2015 brings.